Undercover sting ops. Armed security guards. And several broken bones. All in a day’s work for Kailash Satyarthi, India’s premier child rights activist. For 35 years, this has been his singular purpose—the eradication of child labor and advocacy for stricter laws to end exploitative child labor and slavery. 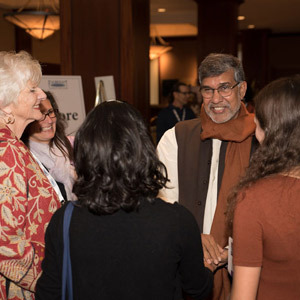 In Atlanta to deliver the keynote address at the Fulbright Association 38th Annual Conference in November 2015, the jovial and amazingly humble Satyarthi chatted with the author about his life’s mission. Kailash Satyarthi made headlines in 2014 when he became the first India-born individual to be awarded the Nobel Peace Prize, an honor he shared with Pakistani Malala Yousafzai. Though hailing from different decades, religions, and countries, the Nobel Committee chairman stated they were both “champions of peace.” Behind the sudden rise to fame however, lie years of unsung effort towards combating the huge social evil that is child labor, often at great personal risk. To Satyarthi, this answer was unfathomable and one that he could never accept. How could children be forced to work, give up their childhood and their opportunities for a different tomorrow? “It still challenges me today, why some children are born to work,” Satyarthi admits. Satyarthi went on to earn a college degree in electrical engineering and after a brief postgraduate stint in teaching at a university, he decided to heed his life’s passion to combat child labor and child slavery. One day soon after, he met a laborer from a brick factory who asked for his help. The laborer, his wife, and daughter had been employed as slaves by the factory owner for over 17 years. Now, the daughter had turned 15 and was about to be sold off to a brothel owner. Deciding to assess the situation firsthand, Satyarthi went directly to the factory. Inevitably, he was “beaten up and bloodied,” but knew he had to find a way to get the helpless laborers out of the brick factory. With the help of a lawyer and influential friends in the high court, Satyarthi succeeded in helping to liberate 36 people, some of whom had never seen the world outside the factory walls. Having seen firsthand the ramifications of child servitude, Satyarthi decided to do more. He founded Bachpan Bachao Andolan (BBA or Save the Childhood Movement) in 1980, and over the next three decades the NGO has been involved in the rescue of more than 80,000 children doing illicit and dangerous work across India. According to the International Labor Organization, there are currently 168 million children engaged in forced labor worldwide (ILO Global estimates and trends report 2000 – 2012). But Satyarthi asserts that initiatives like his are making remarkable progress. In the last 20 years, the number has fallen from 260 million children almost to half. Not only has BBA led the way to rescue children but they have also rehabilitated them back into society. Several BBA-built educational institutes in Delhi and Rajasthan serve to educate and reintegrate freed children to find promising futures. BBA’s work has laid a foundation for the Right to Education law which mandates schooling for all Indian children. Satyarthi’s championing of child labor eradication has completely altered the global perspective of the issue as a question of human rights rather than one that merely deserves charitable assistance. Mahatma Gandhi’s tenacity and philosophy of nonviolence have clearly inspired Satyarthi. Following in the revered leader’s footsteps, Satyarthi has led many protests, marches, and coalitions. He helped found the South Asian Coalition on Child Servitude which connected the group to similar ones in South Asia. In 1998, he created the Global March Against Child Labor across 103 countries which, he says, “led the cause to become a worldwide movement.” During this event, “hundreds of thousands of children and their advocates in dozens of countries marched to tell the story of de facto child slavery and to demand a stronger global convention banning child labor” (http://fpif.org/nobel-committee-got-right/). A logical extension to Satyarthi’s efforts to eradicate child labor was his establishment of Rugmark (now known as GoodWeave) in 1994, a type of social certification for child-labor-free handmade rugs. It monitors, inspects, and contractually binds willing factories in which rugs are labeled and certified to be child-labor free. These rugs are then sold around the world with proceeds benefiting rescued children’s education and training programs. Satyarthi’s social entrepreneurship has helped reduce the number of children illegally working in the carpet industry from one million to 250,000. “GoodWeave aims to emancipate the last 250,000 children working the carpet looms by 2020” (Christian Science Monitor, Oct 2014). Part of Satyarthi’s instrumental leadership is his ability to amass tremendous numbers around what must surely count as one of the world’s greatest movements––to ensure every child has a childhood. He realizes that it is critically important to have the abolishment of child slavery included and measured by the United Nations global goals, often referred to as Sustainable Development Goals (SDGs). “Winning the Nobel Peace Prize has brought unprecedented attention to including child slavery into the SDGs [UN progress goals on top-tier issues for the world’s leading countries]. This would force governments to put in place antitrafficking policies and earmark funds to support them,” Satyarthi states. To say Satyarthi is passionate about wiping out child labor—“modern day slavery” as he terms it—is something of an understatement. The day we met at the Fulbright Association’s 38th Annual Conference in Atlanta, it was the Indian New Year’s Day holiday and after exchanging greetings, I asked him how he celebrated the Indian holidays. Satyarthi described a happy scene spent with family and friends, but without missing a beat he quickly added, “We don’t celebrate Diwali with fireworks because children often work in those factories, where too often they lose their limb or even their life.” Though his work exposes him to the worst in human nature, he is anything but cynical. His message to the world remains clear, coherent, and purposeful: create a place where children are guaranteed an education and freedom. Winning the Nobel Peace Prize didn’t “bring tears to my eyes” says Satyarthi. “My tears of joy are for those mothers, those parents that had lost all hope to see their children again.” Satyarthi continues, “When I see those moms hug their children as if they hadn’t seen a precious child in over 100 years, that’s what makes me shed a tear.” The recognition received is for the children, “for those that cannot speak for themselves, silenced by the [oppression of child labor]” says Satyarthi. For this remarkable individual, awards like the Nobel Peace prize serve to spotlight the children he has helped and to give them hope. That’s what Kailash Satyarthi lives and breathes for––that in his lifetime, he may see the elimination of child labor and the dawn of equal education for all. Clearly, though his battle wounds from his efforts to end child labor may have healed physically, the emotional drive that informs his work remains raw and powerful as ever, as he leads the global charge to end child exploitation. Neha Negandhi is a freelance writer and social change organizer based in Atlanta, Georgia. She was the president of Network of Indian Professionals–Seattle chapter, and a cofounder of South Asian Journalists Association–Atlanta chapter.